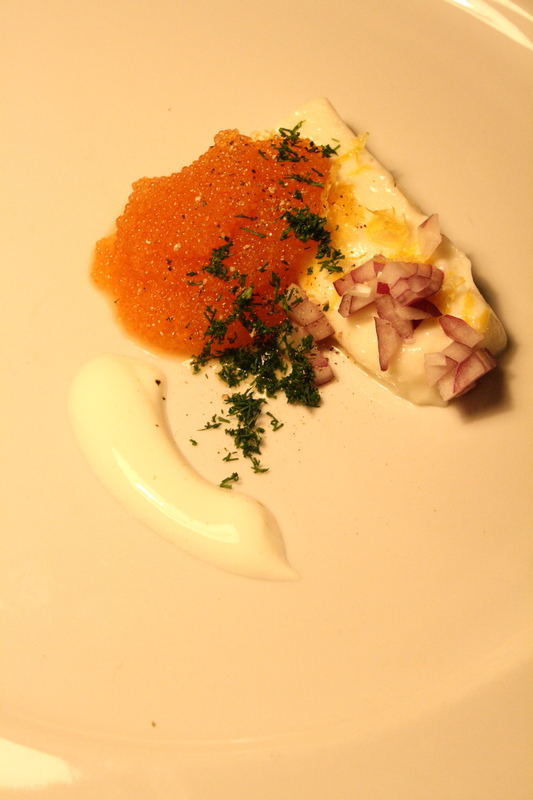 The original recipe for this dish is from a restaurant situated high above the second biggest lake in Sweden, Vättern. The restaurant is not among the best in Sweden but the view is. 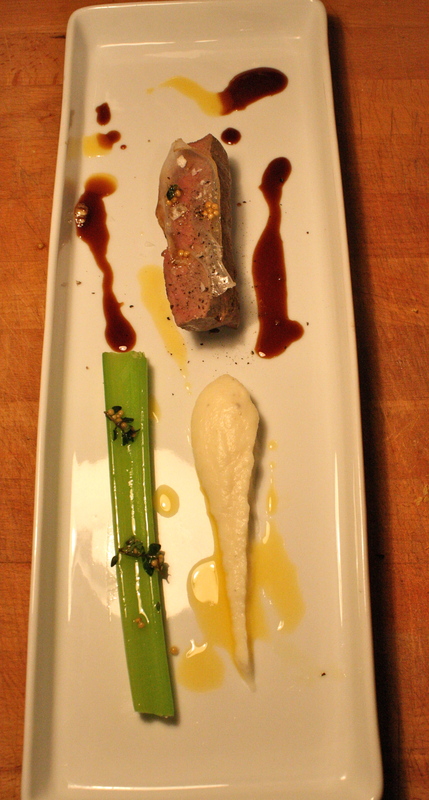 This terrine is delicious and can be served to all kind of meat and together with mushrooms. 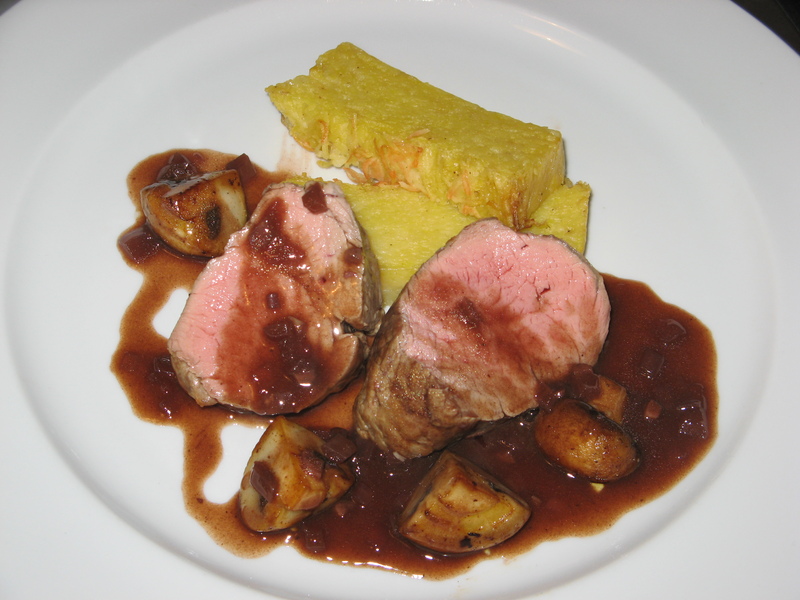 In this version we used fillet of veal but pork fillet or beef also works fine. The recipe is too much for four persons. That’s why we made a starter of the left overs. Mix all ingredients to the terrine and add pepper and lots of salt (potato needs a lot). 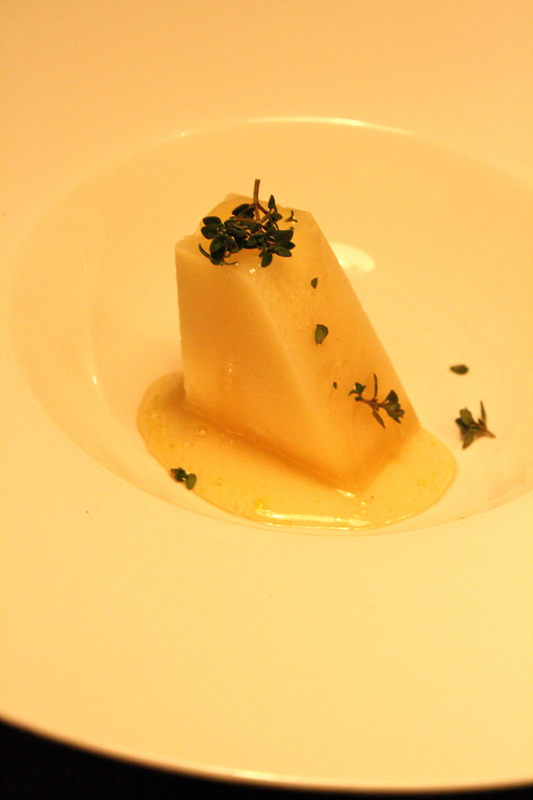 Wrap an oven proof terrine dish with plastic wrap and fill with the potato mix. Bake in 120⁰ C oven for 2 h. It should not get any colour. Put press on the terrine so that it will be easy to cut into slices. Before serving, cut it into pieces and warm in oven. Fry the veal on all sides and bake in 120⁰ C until the temperature of the meat reaches 55⁰ C. Let it rest in paper for 10 min before serving. Fry the red onion and garlic in some butter. Add the sugar and caramelize. Add wine, broth, peppercorns and simmer until the half remains. If needed add thickening. Remove peppercorns and season with salt and more pepper if needed. Serve with fried mushrooms. Start with roasting the ham on oven paper in 200⁰ C until they are crispy. Should take about 10 min. Remove and let the cool down. Decrease the oven heat to 100⁰ C and let the slices of terrine get warm. Meanwhile make the mushroom stew. Cut the mushrooms in quarters. Fry the white part of the spring onions and garlic in some butter. Add the mushrooms and fry on medium heat. After 5-10 min add the cream and the soy sauce. Simmer for 2 min and then add the green from the spring onion and simmer for 2 more minutes. Season and add chives before serving. In Sweden pike is one of the cheapest fishes you could get hold of. It is not the finest fish but it is probably the best one for making mousse. 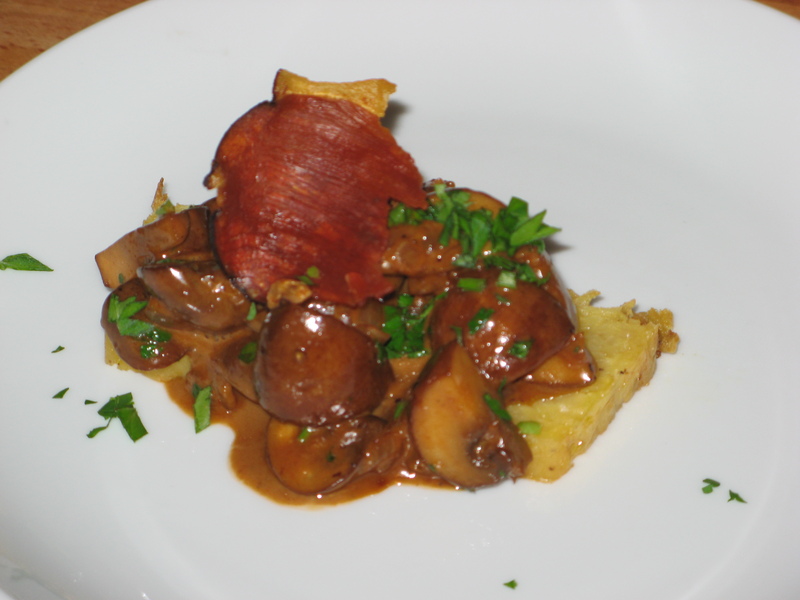 This is a light French dish that is easy to prepare and really delicious. Start with the quenelles. Put the fish with egg whites, salt and pepper in a mixer. Add the cream while mixing. Form quenelles with the help of two spoons. Let them simmer in water until they reaches 75 degrees Celsius. Make the sauce, let lemon juice, fish broth and chopped shallot come to a boil. Cook until half of the fluid remains. Add creme fraiche and cook for another three minutes. Take the saucepan of the stove and add three egg yolks while mixing. Fry the spinach in butter together with a chopped yellow onion. 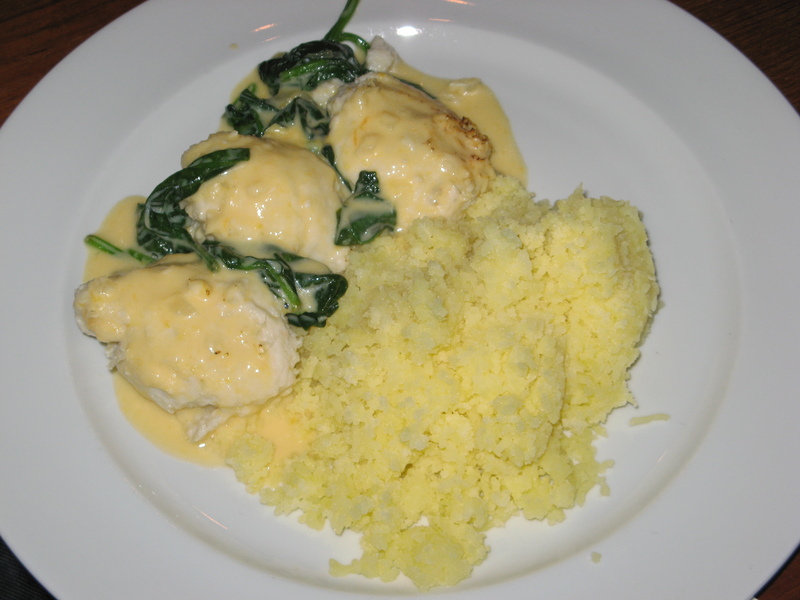 Put the spinach in a ovenproof dish, add the quenelles and poor the sauce over. Grate parmesan over it all and gratinate in the oven until the cheese gets colour. Serve with boiled pressed potatoes. Four friends of delicious food gathered in our kitchen at 1 pm last Saturday ready to prepare a seven course dinner. 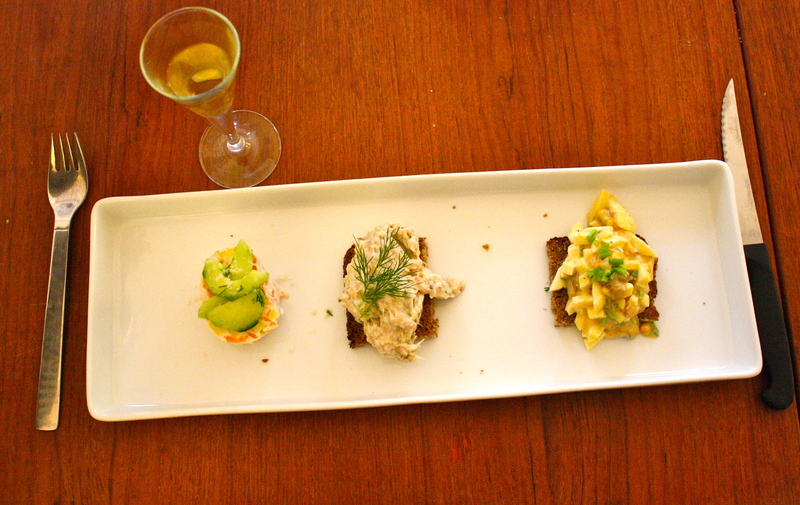 The fridge was full with cold beer and sparkling wine so it became an enjoyable afternoon in the kitchen. 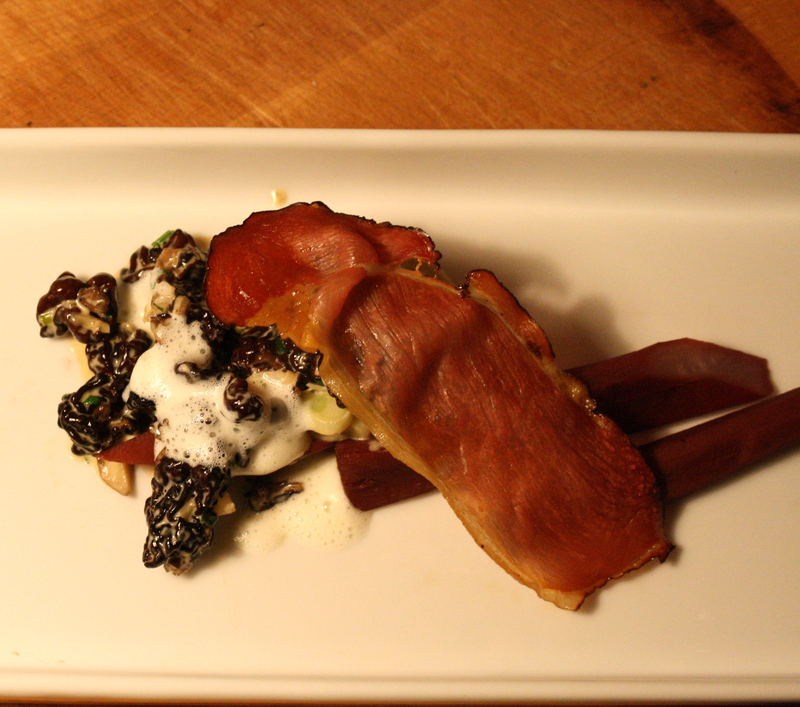 We had our first dish at 6 p.m and finished with liquorice Grappa, Lagavulin and Cognac at 1 a.m. It was a great evening and this was one of the three best dinners I’ve prepared. 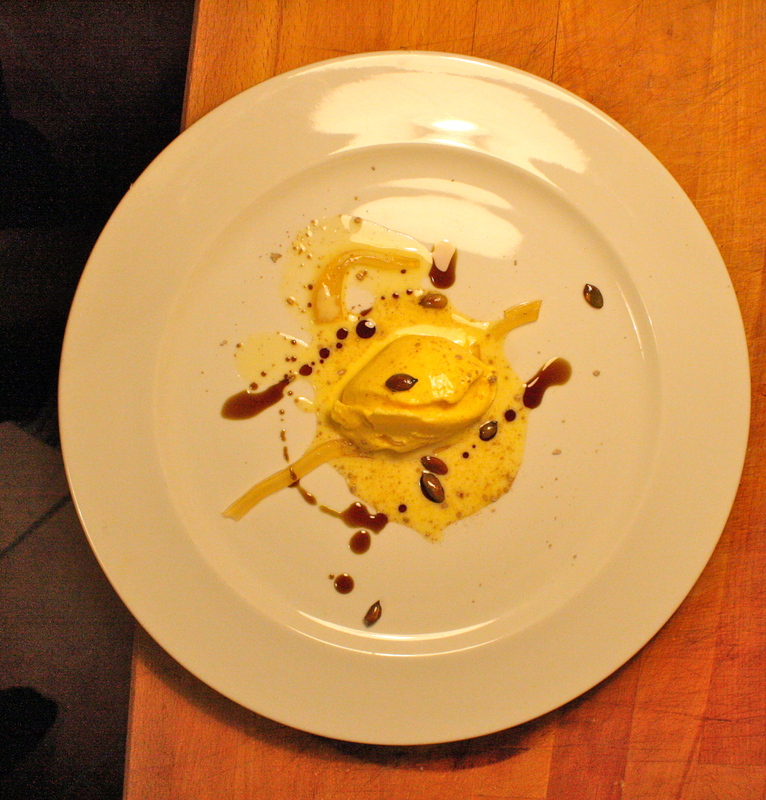 Pumpkin ice cream, liquorice jelly, vanilla custard, pumpkin oil and seeds. The most crazy dish was the pumpkin ice cream and I must say it was a direct hit. The combination of pumpkin and liquorice turned out better than I could ever have hoped for. For the first time I had smoked oysters. 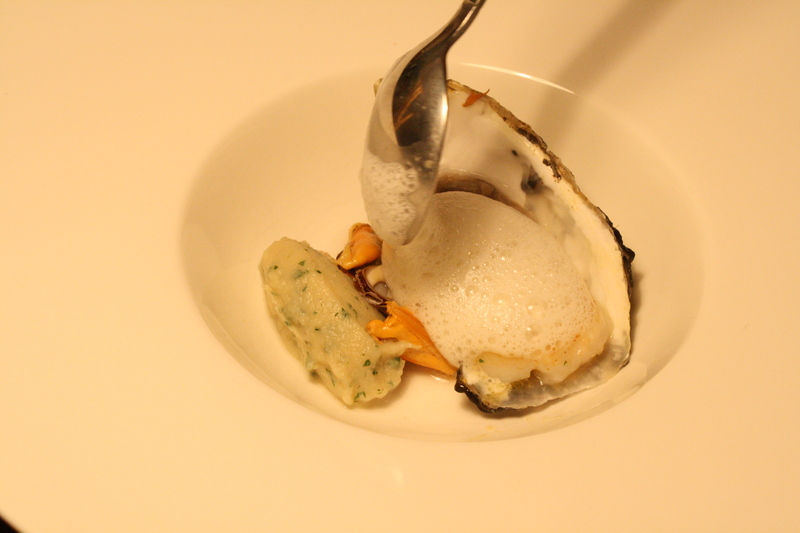 As an oyster fan I was afraid the fresh, salty taste would be put a side by the smokey taste. It didn’t, it gave the oysters another dimension. Try it. Another highlight was the deer with passion fruit juice and 30 years old PX sherry reduction. Thanks for the sherry Axel. Want any recipe, send a mail. Cooked while listening to Bundesliga Radio. 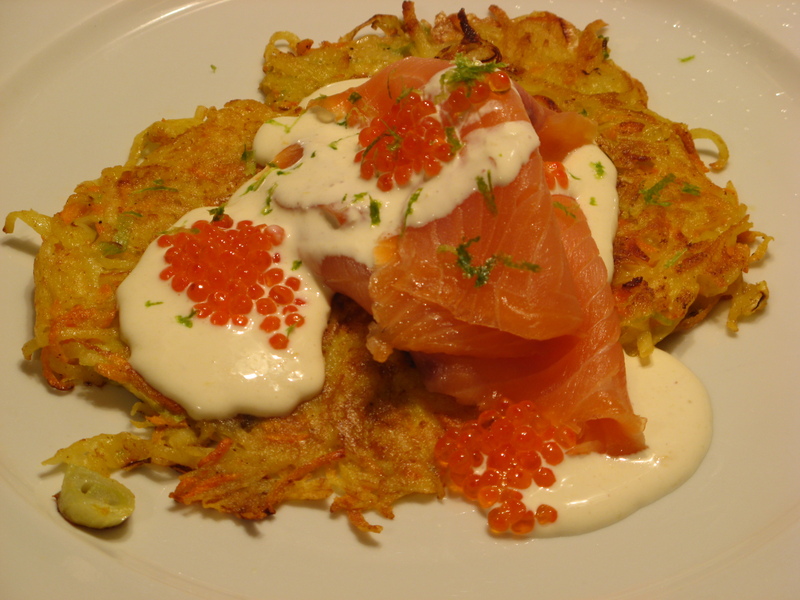 Janssons frestelse is a dish you’ll find at Christmas in every Swedish home. The dish is a gratin made of potatoes, onion, creme and anchovies (Swedish style, seasoned with ginger, cinnamon and all spice). In this dish we used the same ingredients but cocked it in a pan. We served it with a cod. By the way, Jansson is the 13th most common Swedish name. Grate the peeled potatoes into 2 mm thick shreds. Fry with butter on low temperature. Add sliced onions and fry for 10 min. Add anchovies and cream and cook until the potatoes are ready. Season with pepper and salt if needed and keep warm until the fish is done. Cut the fish in four and bake in oven (125⁰c) until the temperature is 50⁰. 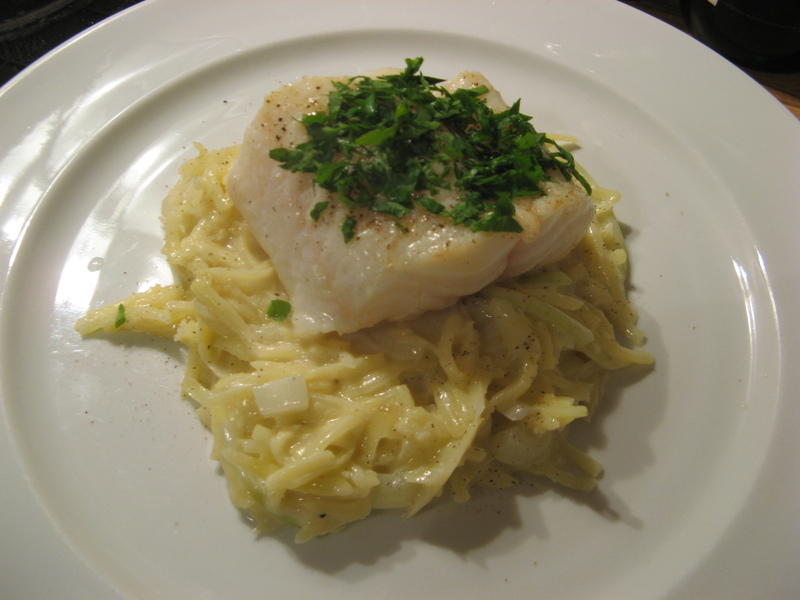 Serve with the potatoes and garnish with parsley. Enjoy! My wife is a food lover, but there are some delicacies that she does not understand. 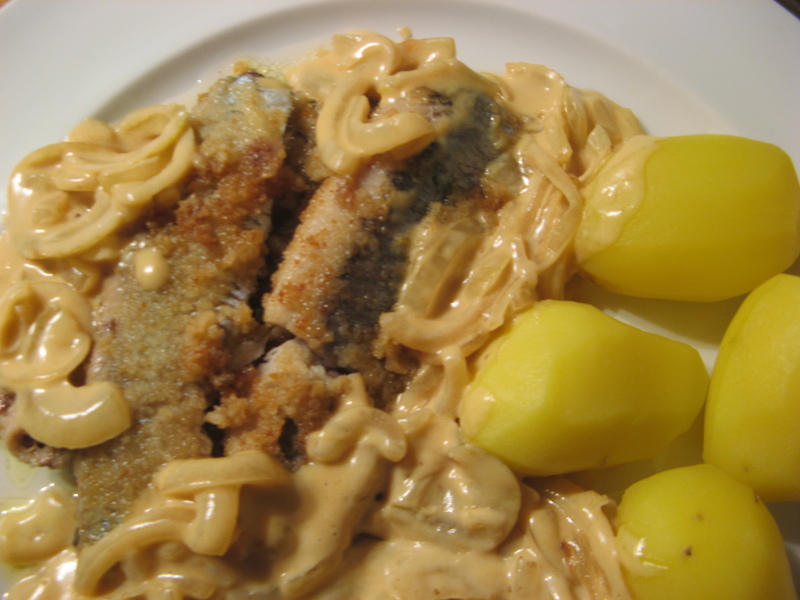 One is fried herring with onion sauce. This is Swedish home cooking west coast style at its best. If you do not find salted herring, put the herring in salted water for 12 hours before preparation. 700 g salted herring (fillets). Put the salted fillets in cold water for 6 hours. Slice the onion and fry it without getting colour. Add flour and stir. Then add milk and cream. Simmer until the sauce has the right texture. Add soy sauce and pepper. Dry the herring and turn them into the bread crumbs. Fry in butter 2 min on each side. 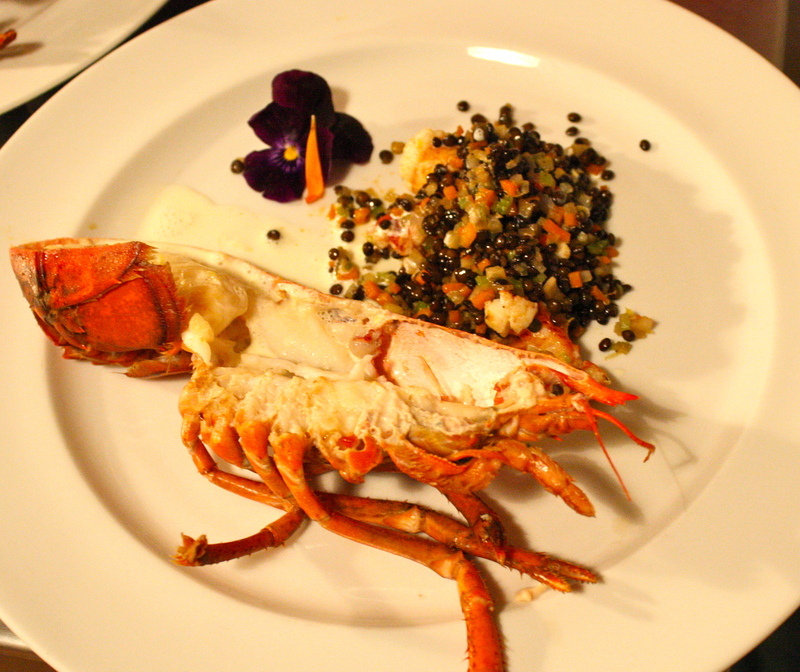 Serve with sauce, boiled potatoes, beer and a snaps. The dinner was accompanied by a handful snaps songs. Yes, you read right. Pork camp and it is not to lose “pork” for the beach season 2011. No, it is to prepare and eat pork for two days outside Berlin. Pork Camp 2011 is taken place at Gut Hesterberg in Neuruppin, approximately an hours drive from Berlin. You can read more about it in this blog.